November 22, 2016 – As a graduate student at the University of Maryland, Omar Abdelaziz took a class in an unfamiliar topic: sustainable energy. It was a choice that would change the path of his life and career. Ten years later, Abdelaziz’ passion for healthy ecosystems and his hands-on work around climate-friendly refrigerants are having a global influence. The Oak Ridge National Laboratory scientist’s work recently played a key role in the adoption of an amendment to the Montreal Protocol that will guide the phase-down of potent greenhouse-gas refrigerants in favor of less-harmful alternatives in more than 190 countries. In his career Abdelaziz has performed both experimental research at the lab as well as analytical work during a stint as a Senior Fellow at the US Department of Energy’s Building Technologies Office in Washington, DC. The work he and his team conduct at ORNL continues to inform better decision-making on energy policy. “I want people to be able to enjoy everything, but at the same time make sure they leave the earth in a better place, without compromising resources for the next generation,” Abdelaziz said of the sustainability concept that drives his work. Abdelaziz grew up in Egypt among a family of engineers. His father is also a mechanical engineer, with a focus on heating, ventilation, and air conditioning (HVAC) systems, while his mother is an electronics engineer in the area of communications. After obtaining his B.S. and M.S. 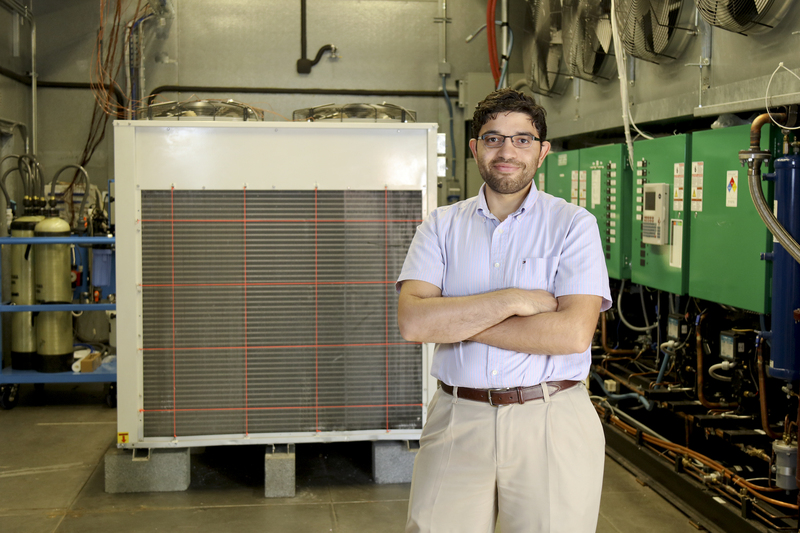 degrees in mechanical engineering at Cairo University, Abdelaziz’ interest in clean energy led him to the University of Maryland, where he earned a Ph.D. with a focus on thermal fluid sciences in energy systems. Abdelaziz emphasizes the team effort behind his work at ORNL, in his role as the leader of the Building Equipment Research group within the Energy and Environmental Sciences Directorate. In his research on cooling systems, “we have proven that there are indeed alternatives to existing hydrofluorocarbon refrigerants that are more efficient and have much lower potential for contributing to global warming,” he said. In addition to “drop-in” refrigerants such as hydrofluoroolefin mixtures and hydrocarbons that can be added to existing equipment, his team is working on brand-new air conditioning systems that will drive even more efficiency gains, particularly in hotter climates. “Working with our system modeling, the team has shown, for example, that we can develop an air conditioner for India that will be almost twice as efficient as the current standard,” Abdelaziz said. In addition to refrigerants, his group is working on innovations in areas such as ultrasonic and thermoelectric dryers. Abdelaziz is also creating a collaborative bridge between his engineers and researchers in materials science at the lab to study topics such as nanoscale heat transfer and improvement of thermoelectric elements. Abdelaziz stresses that the work of sustainability has guided not only his own career, but continues to pull other scientists to US shores. “It’s another form of the American dream, one that is attracting scientists and engineers and changing the US economy. Over the last few decades we have moved in the US from manufacturing, to manufacturing with information technology, and now to manufacturing with intellectual property—new innovations and proprietary developments,” he said. “I could have stayed in Cairo. I was guaranteed a position on the faculty if I had pursued my Ph.D. there. But it was the sustainability work that drew me to this country,” he noted.